If you're one of those people who are looking to take domestic flights, it’s time that you realize that you don't have to actually find a travel agent. Going through the yellow pages or scouring through newspapers has become quite old fashioned with all the online portals coming into the picture. One of such prominent portals is akbartravels.com, which does the job for you in a better way. akbartravels.comis a website with the largest database that provides tickets for the flights to different cities in India and therefore can book the tickets in a profound way, more than any travel agent can ever provide. In order to book the domestic flight ticket online, all you have to do is to head to the online portal and fill the required credentials and get the ticket booked in no time. The webpage will actually show you the list of relevant flights once you have filled the route. The portal can book both the one way, round-trip tickets for flights to Delhi, flights to Bangalore, flights to Kochi, flights to Kolkata, flights to Hyderabad, flights to Mumbai and flights to Goa along with many others as well. You can find all the listings on the internet where you will be guided properly. 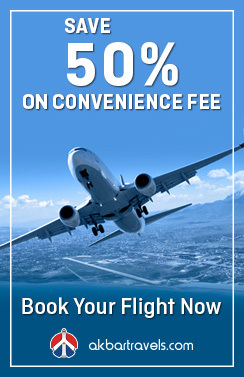 Why choose akbartravels.com for Domestic Flight Booking? Trying to cater the needs of the travelers with the online flight tickets in India; akbartravels.comoffers lowest airfares, greater offers, seamless domestic flight ticket booking, exclusive discounts as well. You can book the entire domestic flight, hotel booking together just through your mobile or desktop with a user-friendly experience. With akbartravels.com, you're just a click away from booking the entire holiday package with features like fare calendar, instant discounts, my wallet, my rewards. As a customer with repetitive booking, you will be added value that can be utilized for further booking. India has been witnessing an acceleration in the travel industry because of the privatization that happened in alignment with the globalization. With symbiotic linkage between growth in standards of living and technological advancement, a lot of people started flying between cities for both private and professional purposes. The domestic destinations and domestic flights have been well built in order to accommodate people for businesses, luxury and leisure purposes. As a result, all the cities in India are connected through Domestic flights in a network. Unlike the older era, where traveling is considered to be a cumbersome affair, today the domestic flights have been increased with more number of airlines being established day by day. Travelling has become an easier issue with Online Domestic Flight Tickets. To make things, even more, easier, akbartravels.com is offering the online flight ticket services to you where you can travel without any hassle. In today's contemporary world where people are finding it difficult to establish a balance between the personal and the professional life; a little help is all we need from the technology. Booming with the low-cost airlines, we at akbartravels.comprovide you with the most affordable online flight tickets making the domestic airline booking convenient and at your doorstep. Through akbartravels.com, you can save time, select the best and optimized flight routes and also with the demand for the cheapest airlines, you can find the cheapest online domestic flight ticket available on that day of the travel. We at akbartravels.comput forth the list of all the available domestic airlines in India and offer you the domestic flight tickets at discounted rates. Our site has a user-friendly design which provides an astounding navigation along with the provision of other features and resources like the ultra new Umrah Packages, checking the PNR status of your ticket online, the price comparison, the airfare according to the calendar dates on the domestic flight tickets, graphs and charts which will tell you the best online flight tickets. Along with these things, you can also see other details at akbartravels.com including the entertainment, the meals or any other services provided by the particular airline. You can also check if the flight has the onboard WiFi connectivity, the seat availability and the pitch included in the particular email. At akbartravels.com, you can also refine the list of flights with many filters which will help you in narrowing the search down and making an informed decision. You can see the filters on the online domestic flight tickets through arrival time, departure time, type of airline, flight duration, price and as well as number of stops. These filters at akbartravels.com can help you in more than one way. For example, if you have a particular domestic flight but with not the amenities that you need or not in the preferred departure time; you can always narrow down the list which makes the booking of the domestic flight tickets faster and easier. After comparing these results, it's up to you to decide which flight you want to take along with the type of carrier through which you want to fly. Once you are sure about your travel, you can also consult the travel agencies to see the free baggage allowed, the cabin facilities, the check-in regulations and also about the type of domestic flight class that you want to travel in. At akbartravels.com, you just have to make an account by registering for it. Once you are done with it, you have to check the domestic flights available for your route, select the particular domestic flight that you want to travel in. Fill the journey details and the personal details carefully (In case if you want to change the details after the booking, there is a high possibility that you will be penalized with the fee) and then proceed to the payment which can be done using a credit card/debit card via a secure encrypted gateway. If at all getting the cheaper online domestic flight tickets is your priority, you can scan the akbartravels.com for various offers that involve cashbacks, giving eCash, getting discounted ticket costs and also some flight+hotel deals in case if you're planning to take a holiday package or taking longer vacations. IndiGo: It is the largest airline in India if we measure it by passengers with fleet size market. It operates with 48 destinations both international and domestic with the main hub at Indira Gandhi International Airport, Delhi. SpiceJet: SpiceJet is another akbartravels.comlow-cost airline, situated in Gurgaon, India. This is the third largest airline in India by the domestic passenger count operating between 55 destinations with 312 flights altogether. Out of the 55 destinations, 45 are domestic flight destinations and 10 are international destinations with main hubs located at Hyderabad, Kolkata, Mumbai, and Delhi. AirAsia: AirAsia has been known as one of the best international airlines and it’s only in 2012, the management decided to have its presence in India because of the tax structure and aviation environment. So, at akbartravels.comwe provide low-cost AirAsia tickets with the Indira Gandhi International Airport, Delhi as the northern hub and the Kempegowda International Airport, as the southern hub. Jet Airways: Jet Airways is a full-service airline situated in Mumbai. It is the second best airline operating in India after IndiGo with 300 flights flying daily to 68 destinations across the world out of which major of them are in India. The main hub of Jet Airways is at located at Chhatrapati Shivaji International Airport with the other hubs located at Indira Gandhi International Airport, Netaji Subhas Chandra Bose International Airport, Kempegowda International Airport, Chennai International Airport and also the Amsterdam Airport Schiphol. Vistara: Tata SIA Airlines, also known as Vistara is the Indian airline with its hub located at Delhi-Indira Gandhi International Airport located in Gurgaon. The carrier is indeed a venture between Singapore Airlines and Tata Sons with the first flight at Delhi. The airline provided by akbartravels.comhas around 21 destinations and indeed it is the indeed the initial airline to give premium economy in domestic flights. Air India: Air India, owned by Air India Limited at akbartravels.comhas been the flag carrier airline in India. It is a government enterprise and it operates over 90 destinations with the main hub located at Indira Gandhi International Airport, New Delhi. It has few more hubs at different countries in India making the online domestic flight ticket booking easier. GoAir: GoAir is the low-cost airlinebased in Mumbai. It is owned by the Wadia Group, established by an Indian business conglomerate. It is the fifth largest airline in India with around 140 domestic flights across 23 cities from the hubs located at Kolkata, Chennai, Mumbai, Delhi, and Bangalore. 2. Fill the cities in "From" and "To" options with the departure and the arrival cities along with the departure and return dates. 3.After filling it, click on the 'search' option. 4.From the list of domestic flights, choose an appropriate airline. 5.After reviewing the flight fares and details, select a particular domestic flight. 6.Enter the traveler details, contact details and make the payment. 7.Once the payment is done, print the eTicket. 1. Is it possible to book return tickets at akbartravels.com? Yes. You can book the return domestic flight tickets based on the availability and at the moment, from and to all the major cities in India. 2. What are the different modes of payment available? The different payment modes that we accept are all major Credit Cards, Debit Cards and Net Banking. Mobile Payments can also be done but they are yet to be included. 3. How can I get the Domestic tickets online at akbartravels.com? Once you have completed the transaction, you can print the Online Flight Tickets using the 'Print Ticket' option available after the booking has been confirmed. However, it is important for you to carry the ticket along with the identity proof with the 'Date of Birth' information so that your reservation stays valid throughout. 4. Is it possible to buy tickets for someone with my card? Yes. If you provide the valid data of the card at akbartravels.com for Domestic Ticket Online; you can buy domestic flight tickets for any person. There is no such rule that the card should be the same as the passenger. 5. Is it possible to cancel the ticket? Can I get a refund? Yes, you can.You will be charged cancellation fee based on the booking value and the cancellation period from the departure of the flight. You can always contact the Customer desk for extra support. In such cases, you will also receive the corrected refund as well.